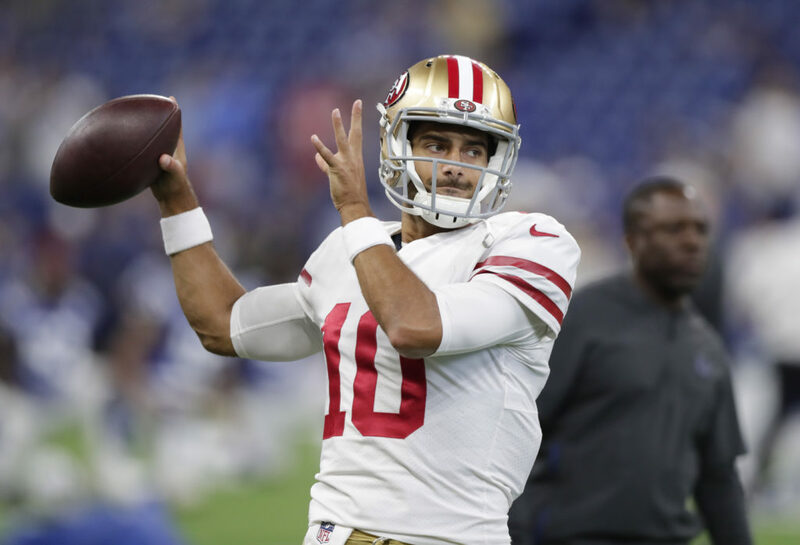 SANTA CLARA — This Sunday, Jimmy Garoppolo will face his biggest NFL test yet: The Minnesota Vikings defense. He never has faced a defense quite like it. It ranked No. 1 in the NFL last season. The best defense Garoppolo played against belonged to the Jacksonville Jaguars last season, and it was extremely talented. It ranked No. 2. Of course, Garoppolo shredded it. He passed for 242 yards and two touchdowns, and the 49ers scored 44 points. But that Jaguars defense was young and immature. After falling behind 10-0 in the first quarter, their players screamed at each other on the sideline. They fell apart. Plus, they were on the road, using the same coverage scheme the 49ers defense uses, which is the same coverage scheme Garoppolo faces in practice every day: Cover 3. Now, Garoppolo will play on the road against a veteran defense that uses a scheme he has not seen. It’s not always about having a chip on your shoulder or exacting revenge. It’s also not about discounting what Jimmy Garropolo did last year or what he hasn’t faced. It’s always high drama on here. How about it’s just a game of X and O’s between a veteran team and a up and coming team? Why does it always have to slant someone? Sorry, JG will not need to be motivated by revenge. That emotion should not be clouding his judgement. JG is living out his dream, to become a starter in the NFL. He has experienced winning a SB. He knows what it takes to win a SB. He just needs to focus on executing the playbook, and scoring TDs. Revenge should be the furthest thing from his mind. When are you going to cease and desist your daily barrage of verbal diarrhea? 10 things JG could do to help win games. 1. Continue sustaining drives, but now, finish off drives by scoring TDs. Settling for FGs is a good way to lose. 2. Work on deception. Try pump fakes, and perfect the read option. Do bootlegs and play action. 3. Look off the safeties by facing one way, while looking in the other direction. It will make the job a lot easier. 4. Counter the crowd noise by doing quick snaps. Do not allow the crowd noise to crescendo. Quiet the crowd by scoring quickly a couple times early. 5. Keep it simple, so no elaborate shifts, Focus on executing the play perfectly, without any unforced errors. 6. Be unpredictable. Threaten either run or pass so the defense cannot stack the box or put 7 in zone. 7. Shape the opponent, and it will make winning easier. One way to shape them is by spreading them out wide, then gashing them up the middle. Encourage the blitz, than attack the zone the blitzer left. 8. Attack the edges, find the seams, flood a zone and target players. 9. Make coaching superfluous by becoming the field general and efficiently run the offense in a no huddle mode. Allow input, but be prepared for any contingency with scripted plays. Try to get the defense to jump offside, and morph the free play into a long strike down field. 10. JG will help the Niners win by getting the ball into the hands of his playmakers. Think screens draws, jet sweeps, outlet passes, bubble screens, reverses, and maybe even the statue of liberty. You should be the last person on earth to talk about idiots. Just like Don the Con should not be talking about treason. Licking Putin’s boots looked treasonous to me. Wait a second…..where’s the flea-flicker? C’mon, if you leave that out, Kyle won’t see it and won’t run it. And what about JG falling down if he runs for a first down? You’re getting sloppy Sebbie–tighten up your game. Yes cannot risk injury. Catch the ball get first down then immediately fall to the ground! JG sliding down feet first after moving past the sticks is such an obvious tactic, you would have berated me for even bringing it up. This first game does not need any razzle dazzle. They should keep it simple, so they can execute the plays without any unforced errors. Of course, if the do run a flea flicker, I will claim that, from my previous posts. If the Niners go 2-2 in the first 4 games, I will advocate for a flea flicker, but crisp execution and efficient play should be a high priority for this first game. Oh, and Sebbie, wouldn’t it be a good idea for JG to read (or listen to) ‘If’ by your buddy Rudyard Kipling before taking the field? Post game he could follow-up with Kipling’s ‘The White Man’s Burden’ while basking in the glow of leading the 9ers to victory. Embark tomorrow on a trans-Pacific sailing trek–just Sebbie in a 14 foot Laser sailboat. Depart Bolinas with the intention of making port in Davao. Bye Sebbie! Have a moratorium on posting things the team, or JG can do to improve their game. And then turning around, and claiming credit for doing obvious things (sustaining drives, scoring touchdowns) that will create better opportunities to win. I could only get through one point before the eye roll and scroll past. No surprise Zimmer has been losing sleep over facing Shanny’s offense, because he hasn’t fared well against him. Given the disaster at the hands of Nick Foles, he’d better be prepared for the Garoppolypse Now! Don’t quit your day job, hun. I’m mostly worried about penalties…. Niners will make their share of plays but how many get negated by costly penalties is my q. Hoping for the best but the preseason was filled with them and the Vikings certainly don’t need any more help. My concern is weak/poor special teams play. Add to that a few costly penalties and the stage is set for a less than stellar 9er performance. There’s that too although if Pinion can hit nothing but touchbacks on kickoffs then we just need to worry about punt coverage where Pinion always seems to help the other team with low hanging short punts :/ On the receiving end of punts I think Pettis may offer an advantage there but we’ll see. If we can get strong returns–meaning great field position–we’ll be in much better shape for offensive play calling. Pinning the Vikings back with great punting would be nice too. We’ve come from low hanging fruit to low hanging punts. The world is a curious place. I do not have a good feeling about this game. The Vikes defense is the real deal and Zimmer is a very good coach. He’s had the entire offseason to prepare for this game. I expect the Vikings to take away Trent Taylor on 3rd downs and play over under Defense on Goodwin to take away the deep throws. Garcon might end up with a good day as a result. On offense, it’s good the 49ers are catching Kirk Cousins early in the season. He will struggle a little bit in my opinion. I expect them to test Sherman early but really target Witherspoon with both their WRs. I do not trust the 49ers defense even a little bit. The Vikings will put points on the board. The question is will the 49ers be able to match it. I just don’t see it happening. If the 49ers can put up 28 on a top tier defense like the Vikings then I will be ecstatic. No doubt in my mind that Shanny’s offense will move the football up and down the field, but the only way they get to 28 is if they cash in for 7s instead of 3s…. A few days ago, after hearing that Jerick the “Jet” McKinnon had torn his ACL, I offered my opinion as to just how devastating the injury was for the team, in large part, due to the timing. This is almost worst case scenario, IMO, with the exception of losing Jimmy G, or Joe Staley! Some on this site suggested that other personnel groupings could simply run the same schemes, and individual plays. While technically true, there is a big difference between Matt Breida or Alfred Morris & Jerick McKinnon when it comes to executing the playbook Kyle’s been working on for months, including his meticulously crafted gameplan for their week 1 opponent, the Minnesota Vikings! In some respects, it’s back to the drawing board for Kyle, a mere week before the start of the season, with a significant portion of his early season schemes no longer looking nearly as viable, due to the loss of McKinnon. I have no doubt that Kyle will make the proper adjustments over time. The problem is, time is not on his side. The season is upon us, and the schedule makers did the 49ers no favors with the early portion of their schedule. This is a major loss, and fans need to understand just how seriously this effects the offense. There is a reason that Kyle and John were so aggressive in their pursuit of Jerick. Kyle has been looking for a featured RB with Jerick’s skill set,to allow him to take his offense to new heights. And he’s just lost that player, 8 days ahead of opening day. This is a tough test. In fact, I’m not sure there’s a tougher place to start the season in 2018, than on the road, in Minnesota. Considering the Vikings defense, along with their incredible home field advantage, this is the type of game that can get out of hand in a hurry for the visiting team. Add to this, a scenario where the visiting team just lost their featured tailback, and I think there are a number of teams in this league whom would fold up like a cheap suit, given the circumstances. However, I don’t think the 49ers are going to allow this game to snowball on them. They will be competitive. And there’s a reason they play these games. Will the 49ers shock the world, and pull off an upset, against all odds? You make some good points 49. I think the loss of Jet is a BIG deal. Having said that, I like how KS went out if his way to state that we’ve successfully operated this offense without Jerrick. He makes a great point. I believe we still have the personnel to have an explosive and entertaining offense this year. But I do expect it to take a few weeks to jell. It’s going to be a tough game. If we go up there and get destroyed I dont think anyone should panic (but the fans will). It will serve as a early season wake up call that will toughen us as a team. If we win? ?……We send a big message to the rest if the league….either way, hang on to your hats, we are in for a very entertaining year. This is the most excitement we’ve had in Ninerland in quite some time. BRING IT ON! It’s the timing of the injury that makes it so troublesome. I agree with you that Kyle and Jimmy will eventually right the ship. The reason I felt compelled to make this point more than once is because a lot of Niners fans seem to be in denial. The assumption is that they can still run the same concepts, only with different personel, without losing anything, and that’s just not true. If they weren’t handed such a difficult schedule in the first half of the season, I’d be less concerned. As it was, even if everything had broken their way, it’s was going to be rough sledding early on, so to speak. The 49ers are on the right track. I do believe Kyle and John are building a contender. But boy, it’s these kinds of injuries that can derail a season, especially when your talking about a young roster. I hope fans are realistic, and understand that the 49ers braintrust are putting the right pieces in place, even if the team struggles in the first half of the season. This is only year 2(!!) of this complete FRANCHISE teardown and rebuild, and we are light years ahead of anyones best expectations. The fact that we can even entertain the idea of beating maybe the best team in the league or making the playoffs is such a testament to the direction our proud franchise is taking. We were basically signing kids off the street just last year…are you kidding me?! So if we stumble out of the gate let’s keep our sense about us, take our lumps, not panic, and be proud to be Niners fans in this new, fresh era. The 49ers are forging a new paradigm into how to truly rebuild a franchise. Let’s just enjoy the journey. Its gonna be so much fun! 49reasons – You hit this on the money. Shanahan’s secret-but-not-secret plan… while everyone was shouting Jimmy, Jimmy, Jimmy he was scheming Jerick, Jerick, Jerick. Shanahan’s major draft/cap investments were Richburg, McKinnon and McGlinchy. The improved run game was supposed to be key in slowing the pass rush with play action. (Will miss McKinnon’s pass pro too). The 49ers will still be an improving team, but the wins would be more frequent and/or by bigger margins if McKinnon was healthy. Thanks Brodie, back at you. Jerick McKinnon is a halfback who runs routes, and catches the football like a WR. Grant wrote a piece a while back in which he spoke of the similarities between McKinnon and Breida. They are frighteningly similar (in fact they both went to the same college, and were at one time even on the same squad, due to one overlapping season) in terms of size, speed, and running style, but that is where the similarities ended, as far as I’m concerned. Jerick is, by far, the better, more natural receiver, and he has honed his craft in terms of route running and pass protection during his 4 seasons in Minnesota. He’s the RB Kyle identified early on, maybe even going back a couple years, as a player who could take his offense to the next level. It’s Jerick’s ability in the passing game that separates the “Jet”, from a Matt Breida, or Alfred Morris, or Raheem Mostert, or the vast majority of tailbacks in the league. And Kyle’s been scheming with the intention of using Jerick as nightmare mismatch for opposing defenses, since the day he was signed. Kyle’s been meticulously scheming ways in which he could use jerick to exploit defenses like the Vikings, all offseason. You simply cannot replace a player with such a rare skill set, with another player on the roster, and expect the same results. That’s just a fact. And now Kyle’s going to have to make big changes to his early season game plan, which is never a good thing this close to the start of the season. The timing couldn’t be worse, and that’s the biggest problem with this injury. Sure, Kyle’s got a lot more up his sleeve than Jerick McKinnon, but you only get so many reps, and so many opportunities to practice your game plan, during the offseason and training camp. Those kinds of adjustments made, almost overnight, usually don’t go smoothly. Not on the road against the league’s best defense! And 3 of the 49ers first 4 games are on the road, against very good teams, followed up with the Green Bay Packers, and the LA Rams, with only the Cardinals sandwiched in between. Barring more significant injuries, I expect Kyle and Jimmy to have this offense absolutely humming by midseason. The question is …… will that now be too late? I sure hope not, but man, that’s a tough hand to be dealt! But what other options does the team have? This is a “next man up” scenario plain and simple. McKinnon is out for the year and nothing the Org can do with bring him back. Unfortunately, this type of injury takes place every year in football. It’s happened to Joe Montana, Jerry Rice, Tom Brady, Teddy Bridgewater and many other top tier players who were the focal point of the teams success. We will roll with Breida, Morris and Jucze for now and hope for the best. 49reasons tell us something new. please….. we all know this already. Hope I’m wrong. Minn 27 SF 13. They will try to stop Trent Taylor on third downs, as someone said earlier, but that won’t be too easy to do. I see him and Garcon having decent numbers. Juice will get some good looks. Barr will have his hands full even without McKinnon there. On D, I’m actually most afraid of what Cook can do. I think Fred Warner is an X factor. I loved Cook coming out, but he’s less than a year removed from ACL surgery. I think he was averaging just under 20 carries a game, so I’d be surprised if he gets more than 12 carries in this game…. Yeah, that’s my take as well. The 49ers run defense is awful until they prove they are not awful. We don’t have Foster for this game and the 49ers just traded Eli Harold. The LB group is a work in progress right now so I expect a bumpy road in the first game. I don’t expect Cook to have a huge day but I do expect the Vikings to be able to rush the ball well. If you want to join the blog game picks group it’s open to everyone. All we ask is you use the same name to sign up as you do on here so we know it’s just people from this forum. First game of the season — so I tend to take the under, in this case 46.5 points. Add to that a top Vikings D and a Vikings offense with a new QB and a questionable O line (new center making second start and two sub-par tackles). The primary RB is returning from an ACL tear with little preseason seasoning, and will see limited action. Niners D will be much improved, first in scheme and execution and second in confidence. No coach knows Cousin’s strength and weaknesses better than Shanny. On offense, I think Niners will feature a lot of 21 personnel with Morris racking up over 70 yards. Expect Taylor and the TE’s to continue playing a big part in keeping the chains moving. The game will be close, but the Niners have one of the 2-3 best fourth quarter QBs in the league. Niners win 23-16. The one area the Niners can expose is the Vikings OL and in turn disrupt Cousins, but I don’t put a lot of credence into Shanny knowing his strength’s and weakness’. They haven’t been together in a long time and Cousins is a very different QB than he was back then. I hope you’re right on the prediction, but realistically the Niners should lose by at least 7. The Vikings are a vastly superior team all over the roster, are at home and focused on SB or bust. The Niners should keep it close enough to be interesting, but expecting them to win under these circumstances is wishful thinking. I just wonder/hope that Saleh brings pressure w the Vikings dinged OL……. and if Sherman is 100% and can play to form, then just think of the options that affords- I only wish Foster was able to go as him and Warner will be fun to watch soon. I don’t see you on the pick em list yet. Make sure you get in before kick off tonight. alright, alright………. talked me into it- at some point we need to put some skin in the game though. And Hikutini is spilling his guts…like William Wallace. Barrows reports in The Athletic: “Shanahan said he wasn’t concerned that the Vikings signed tight end Cole Hikutini, whom the 49ers cut on Saturday, to their practice squad. It’s a mind game. That’s all it is. Remember, football is 80% mental and 40% physical. The wildcard for this game (and potentially future games) is going to be the pass rush for the 49ers. Based on what I saw during the preseason, the 49ers have the potential to generate pressure from the interior, but they lack the edge rusher that is needed to finish what Buckner, Thomas, and Armstead start, or at least drive the QB back to the aforementioned three. In the end, I think that will be the deciding factor in the game. I tend to agree w that, in addition to seeing what Sherman looks like as that will determine if teams are going to focus more on Witherspoon………..and why I am hoping we see some blitzes or moving Buckner around since the interior has depth, unlike the outside pass rush- I think Marsh is too light and ineffective. I am comfortable w Coyle and Warner and am anxious to see Tartt and Colbert seeing as people seemed a little down on them this preseason. I’m hoping Ronald Blair III will show up this season….keeping fingers crossed that he gets at least 5 sacks! The Vikings have a soft white underbelly in Jones at Center who rated out at 66.8 last year, which is below average. The 49ers only had 30 QB sacks last year. I see an improvement of 10-12 more this year from a variety of sets and schemes. Just for the heck of it I’ll go with 43 sacks this season. How many for Dfo, Solo and Double A? They will get their share, but different sets and package schemes will likely cause the sacks to be divided among several players. Getting 40+ sacks is close to normal for most teams, heck, even if they get 35-38 is an improvement from their lowly 30 of last year. This year’s draft was about protecting Jimmy G. We get our ER in 8 months. Nike chose Kaepernick over Tillman for their new sacrifice it all commercial, and I expect their new tag line to come out shortly. Just Blew It. Lol. Well we know what side of the fence Nike falls on. Personally I prefer Adidas. All I care about is if the shoe is comfortable and doesn’t cause my wallet to bite into my leg. I’m not into popular brand names. When a person gets to be as old as me comfort wins out over style all day. But as far as Nike deciding to go with Kaep, it’s within they’re right to do so, and to face any consequences that arise. No argument there AES. However, I can definitely say that the message is awful, and that regardless of Kaepernick being a part of it. Sign me up for ’60s vintage Converse tennis shoes–low cut, black tops. I wear the high top Chuck Taylor’s in black. Chuck Taylor, best shoes ever. Doesn’t really change the fact that there is no example of sacrificing in regards to Kaepernick. Had he not kneeled, no one would care if he was still in the league or bagging groceries at the local mom and pop. Kaepernick started out sitting on his duff until a green beret convinced him that kneeling would be more respectful. It’s a calculated business decision, and seems logical. How many Nike shoes do Rush Limbaugh’s listeners buy? Hannity’s viewers? They and Bannon and Fox Network and David Duke and #45 continually bash, diss, discount, and insult the market demographic group of likely Nike buyers. Looks like Nike isn’t too worried about losing market share, and there is the added bonus that every attack on CK amounts to free advertising for Nike and for CK’s brand which Nike now distributes. I agree it’s all about business. Nike could care less about civil rights. This is a way to get them free publicity and keep a 50 year old company relevant, while at the same time sell boots to the US Military. Razor. Please. Let’s keep this blog focused on football. Sure, just as soon as you take your own advice wrt Seb. MWD, the orange tub of goo has made buying a f-ing Harley into a political act. That’s the world we inhabit now. Doesn’t mean everyone should play to that tune. So…why the polarizing political comment? Can we keep this to football–polarizing enough as it is? Please. Let’s stick to the 49ers 2018 season. Game will hinge on the play of 11 key people. D: Buckner 1.5 sacks 15 hurries, Thomas 1.5 sacks 5 tackles for loss, Sherman 1 int. 5 passes broken up. Witherspoon 2 passes defended total of 20 YAC’s. 3 guys on special teams. Add…. Pinion — 48 yard punting average, with <9 yards total in Minnesota returns; two punts downed inside the Vikings 5. So Sponge Bob…how are things at Bikini Bottom? Be glad you got Grant. At lease he is Simi object in reporting the team. Here in Chicago the sports reporter s have the Bears winning the Super bowl cause of the Mack singing. If the Bears beat the Packet on Sunday nite might as well cancel the rest on the season and give the trophy to the Bears. And, we need to exit the game with no significant injuries. 49ers: $37,527,282……no reason Mack and Bell should not be on the team….. I think there are at least a few reasons beyond just the money why they shouldn’t be but in terms of salary cap it’s not about can they do it as much as should they? There were/are teams out there that are in the right position for those types of players. I don’t think we’re one of the them though. The Rams made sense. Much closer to making a SB run then we are. Made more sense ultimately for them to go with Donald, paid less and didn’t have to give up picks. I think with the contracts going around, the 49ers really need to look at extending Buckner towards the end of the season if he is healthy…….. I think 2021 is going to be really interesting as the players try and get into the NFL’s coffers. I think it’s funny he gave up on writing out the full team name and instead switched to abbreviating the city/state name instead. LOL at the poor Panthers that became CA. Man, that’s Grant on a Tuesday kind of lazy. Are you joining the pick em this year? I’m going to sit this season out. Glad to see you’re keeping it going. Come on, man, it’s fun! Nothing to lose. Garoppolo joins a host of young stars who will wear Jordan Brand cleats this season. There’s only two. Garoppolypse Now and All Hail Kizer! Daeshon Hall in, Niles Scott out. In recognition of his eminence, do you think Sebbie could get a shoe deal–Crocs maybe? As in croc(k) of…. Yeah, this is what his eminence appears to miss – while teams may well look to get some intel from past players/ coaches, the intel they can provide that is of any use is generally quite limited. At best they may be able to confirm some things you already knew from study. Which is why it doesn’t make sense to sign players just for this purpose. Sure, intel is not the sole reason a team will win or lose, it it just hedging your bets. If Zimmer did not think Hikutini would provide any actionable intel, he would not have signed him. Guess what? Zim Tzu did sign Hikutini, because he is desperate, and knows this game against the Niners will be tough. Zimmer watched his O line disappear. He is in a world of hurt. The whole offense is brand new, including the QB. Cook is gimpy? No wonder Zimmer is grasping at straws. Hikutini provides an insight about the locker room dynamics and a scouting report on every Niner. No scout or other team personnel have access to the Niner locker room. Hikutini did not have to memorize every play. He just needs to divulge tendencies and insights. Sure, I will fully admit that intel may be important, but even with intel, a team can lose. Glad I listened to John Lynch today. He was mentioning something about ‘Coach Speech’. I wonder if he read that phrase that was written here yesterday? Yes, KS will downplay any importance of intel, but he did the exact same thing. He poached Golditch, and O lineman from the Chargers. The Niners play the Chargers in a few weeks. JL and KS also signed another player who could give actionable intel. Jerick McKinnon could give good intel on the Vikings, even with a repaired knee. Since 10 out of 11 defenders have returned to play this season, JM could give a detailed scouting report about every 10 defenders. To all the genius’s who declare that intel is so unimportant, no coach would ever think about obtaining any, I will just point out that Bill Belichick has done that for years, and has won 5 rings. Of course, it can happen the other way, too. The Eagles players, Blount and Long, provided Intel on their former team, the Patriots, and won a ring. Great! What other former Niners can teams poach? Actual professional football is to be played today. Begging for practice footage table scraps just to get a glimpse of players is soon to be over. Can’t wait.